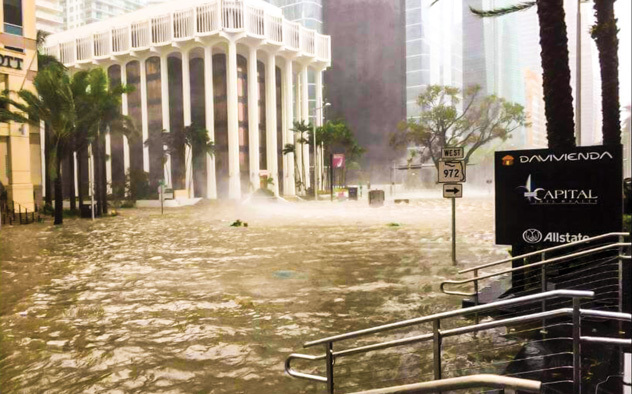 City of Miami officials have calculated a preliminary cost estimate of handling debris from Hurricane Irma, $73 million, as they continue to dig out from the storm’s lingering impact. Christopher Rose, director of the Office of Management and Budget, gave commissioners the tally during a budget report last week. The massive clean-up continues while residents and others assess the damage and critique the city’s response. Mr. Rose said the city will seek FEMA (Federal Emergency Management Agency) reimbursement, according to the Federal Stafford Act, for most storm-related costs. He told commissioners FEMA should reimburse 90% of the cost of debris removal, with the city and state splitting the remaining 10%. Asked to estimate the final cost impact to the city for all Irma-related items, Mr. Rose said $5 million to $7 million. Hurricane Irma hit South Florida Sept. 10, bringing storm surge and winds that tore through the tree canopy. Downed trees, broken branches and other clutter churned up by Irma quickly piled up on the sides of streets citywide. The city’s own clean-up crews and a fleet of private contractors began to collect the mess, but process was slow. Compounding the problem, residents began mixing bulk household garbage and debris onto the mounds of trees and branches. It took more than a month to remove the bulk of the debris from the streets. On Oct. 17 the city announced it had completed the first pass of debris collection and would be starting the final pass to pick up any leftover hurricane-related debris. The Department of Solid Waste was set to resume regularly scheduled bulky trash pickup this week. Meanwhile, Virginia Key Advisory Board members continue to complain that the island is a dumping ground for storm debris, and perhaps more worrisome is the addition of household garbage including mattresses, couches, paint buckets and more, raising concern that the water runoff from the massive piles could pollute the island and the bay. Kevin Kirwin, parks director, said the city is doing all it can to get debris separated, compacted and removed from the key as soon as possible. At the Oct. 26 meeting, one resident complained of massive debris caused by uprooted trees and snapped branches, and asked who dropped the ball in keeping trees trimmed, the city or Florida Power & Light Co. She said the city needs a smart and fair tree removal process, and a less cumbersome process for residents to get tree trimming permits. Commissioners handled two related items last week. In one, they retroactively authorized the city manager to sign an understanding with Miami-Dade County for removal of debris from county-maintained rights-of-way due to Hurricane Irma, and retroactively authorized paying for the work. They also approved an agreement with private property owner 1010 NW LLC for the use of 206,530 square feet of land at 1010 NW 72nd Ave. for the staging of debris from Hurricane Irma, at a cost of $23,800 a month. The resolution also authorizes the city manager to negotiate similar agreements if needed with additional property owners, private and public, to clear the remaining debris from the city. Did Virginia Key become Irma’s dumping ground?